PayNearMe, an alternative payments product from the company formerly known as Kwedit, provides a compelling way for the ‘unbanked’ to use cash payments for online goods. The “unbanked” refers to consumers who don’t have traditional bank accounts or cannot qualify for credit cards. PayNearMe allows people who don’t have or don’t want to use credit or debit cards to purchase products, pay for bills and more with cash at thousands of 7-Eleven stores in the continental U.S. And today, PayNearMe is announcing it’s first implementation of its utility bill product the City of Fairfield, Calif.
Here’s how PayNearMe works. With participating partners, e-commerce or merchant sites, consumers can use the PayNearMe option to pay for purchases or debts owed. You simply place your order with PayNearMe and print out the given receipt. You then take that receipt into a 7-Eleven and they scan it and you pay in cash. Once you pay, your order with the retailer or merchant will be fulfilled. With the utility bill payments, PayNearMe partners with Fairfield billing service provider InfoSend to us PayNearMe’s Embedded Barcode Remittance (EBR) technology. 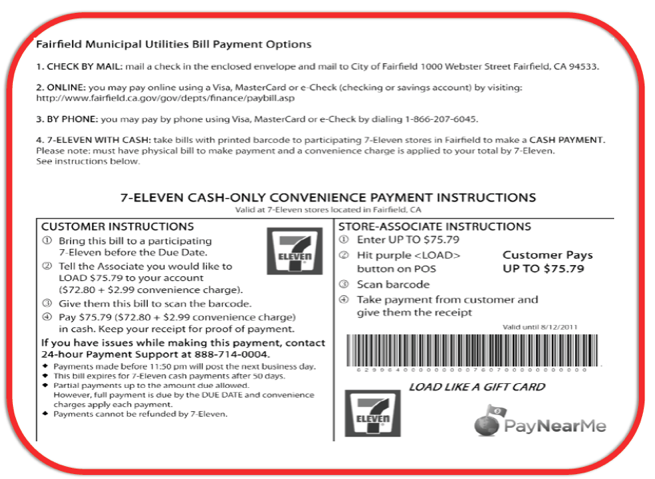 With the technology InfoSend prints a unique barcode directly onto each City of Fairfield utility bill. Upon receipt of the bill, customers can go to any local 7-Eleven where their bar code is scanned at register. They complete the transaction by paying in cash. The funds immediately post to customers’ accounts, and they receive detailed receipts for proof of payment. PayNearMe says that because 7-Eleven stores are open 24 hours a day, seven days a week, Fairfield customers gain greater flexibility in how and when they pay their utility bills. And InfoSend works with 200 other utility partners, and PayNearMe plans to provide this cash payment option to these cities as well. PayNearMe has steadily expanded the use cases for the cash payments product, recently announcing the ability for consumers to pay bills, transfer money, and even pay for a bus ticket using its payment option. And the startup says that 60 million consumers in the U.S. don’t have debit or credit cards, which is a huge market to serve.